COMPANY PROFILE Target Corp is one of the largest department store retailer in North America. It is engaged in operating general merchandise discount stores. Target is one of the largest retailers in North America, with about 1,800 units across the U.S. Its large-format stores offer general merchandise and an assortment of food products. Target sells roughly approximately 33% of general merchandise under private label. The firm has an expanding Internet sales presence and issues its own consumer credit card, REDcard, which gives customers a approximately 5% discount on all Target purchases for retaining the card. 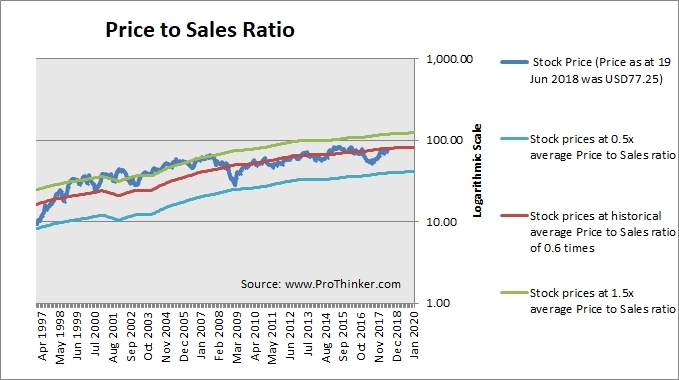 At the price of USD77.25 as at 19 Jun 2018, Target Corp is trading at a Price to Sales Ratio of 0.6 times last 12 months sales. 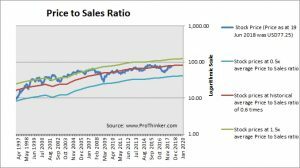 This is a 3.0% discount to its historical average Price to Sales Ratio of 0.6 times.